Boyes, Farina & Matwiczyk, P.A. today announced partners William (“Bill”) E. Boyes, John Farina and Peter Matwiczyk, along with attorney Duane L. Pinnock, have been named to the 2018 Florida Super Lawyers. Boyes, Farina & Matwiczyk, P.A. 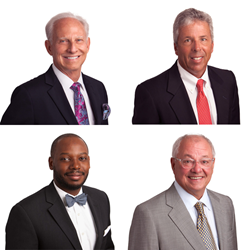 today announced partners William (“Bill”) E. Boyes, John Farina and Peter Matwiczyk, along with attorney Duane L. Pinnock, have been named to the 2018 Florida Super Lawyers. The recognition is in the areas of Estate Planning and Probate for Mr. Boyes, and Estate and Trust Litigation for Mr. Farina, Mr. Matwiczyk and Mr. Pinnock. Super Lawyers is a rating service of outstanding lawyers from more than 70 practice areas who have attained a high-degree of peer recognition and professional achievement. Bill Boyes has been Board Certified by the Florida Bar in Wills, Trusts and Estates for more than 25 years, and has been AV rated by Martindale-Hubbell for over 30 years. He has been named to the Florida Super Lawyers for 12 consecutive years. Mr. Boyes is also a Fellow of the prestigious American College of Trust and Estate Counsel (“ACTEC”) and has been a member of the ACTEC Fiduciary Litigation Committee since 1997. John Farina is Florida Bar Board Certified in Wills, Trust and Estates and Businesses Litigation. He is a Top Rated Lawyer in Commercial Litigation and Trusts and Estates, both by American Lawyer Media and Martindale-Hubbell™. Mr. Farina is certified in Civil Trial Law and Civil Pretrial Practice by the National Board of Trial Advocacy. He was recently named a Top 100 Trusts and Estates lawyer by the American Society of Legal Advocates for the fourth consecutive year. Peter Matwiczyk is Board Certified by the Florida Bar in Wills, Trusts and Estates and a member of ACTEC and its Fiduciary Litigation Committee since 1992. He has been AV rated by Martindale-Hubbell for more than 30 years. Mr. Matwiczyk has regularly been named a Florida Super Lawyer in Trusts and Estates litigation and has been listed in Best Lawyers for more than 15 years. A Florida Super Lawyers Rising Star™ in Trusts and Estate Litigation and a Florida Trend “Legal Elite: Up and Comer,” Mr. Pinnock is Florida Bar Board Certified in Wills, Trusts and Estates. In 2016, the Florida Bar appointed Mr. Pinnock Chair of its Wills, Trusts and Estates Board Certification Committee for the 2016-2017 term. He was also named a “2016 Top Lawyer” in the South Florida Legal Guide’s 2016 edition. Boyes, Farina & Matwiczyk assists clients in the development of estate plans, the administration of complex trusts and estates, and the prosecution and defense of probate related litigation, including tax court controversies. For additional information on Boyes, Farina & Matwiczyk, P.A. please visit the firm’s website at BFMlaw.com. For media inquires, contact Kristen Lunceford at 561-308-4741 or via email at kristen(at)bellagroupinc(dot)com.